The Somerville is well known for its fine dining, with lunches, afternoon teas and five-course evening meals all available throughout the year. The hotel's service and hospitality perfectly match the building's grand surroundings. Guest rooms are large in size and offer modern facilities within a luxurious and relaxing environment. Holidays for the Somerville Hotel for 2019 are currently only available to book by phone. Please call us on 01534 496 650 for assistance. The Somerville offers a selection of Classic and Superior rooms. All guest rooms are en-suite and equipped with tea & coffee facilities, in room safe, digital flat screen television, direct dial telephone, hairdryer, bathrobes and free Wi-Fi. Superior Rooms are larger than Classic rooms. Superior Garden Sea View Rooms offer ultimate luxury with a private terrace, cocktail bar, fridge/freezer, large screen television, seating area with table, walk-in shower and bath. Tides Restaurant offers a gourmet table d’hôte and à la carte menu. The restaurant room overlooks the hotel’s garden and St Aubin’s Bay, a splendid setting in which to taste some of Jersey’s best produce. Open to all and ideal for drinks and light snacks, inside or al-fresco on the terrace when the sun shines. 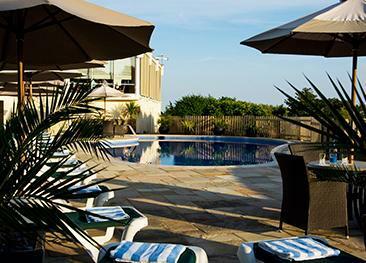 The hotel has a beautiful outdoor swimming pool and peaceful sun lounger area. There is a lift to all floors and disabled access to all public areas, but no disabled rooms. St Aubin is probably the most picturesque village in Jersey with its little harbour bordered by restaurants, independent shops and a charming arts & crafts gallery. St Aubin’s Bay runs all the way to St Helier with a promenade popular with walkers and cyclists. 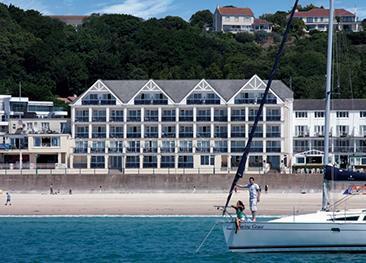 All the staff were very friendly and polite, the hotel and our room was excellent with superb sea views over St Aubin Bay. The food in the hotel was delicious with a wide choice from 3 menus, and this also includes a wide Gluten free selection. Highly recommended. Brilliant hotel, very well appointed and comfortable rooms. Very nice bar and restaurant, lovely food and great cocktails concocted by Fabrizio. All the staff could not do enough to make our stay as enjoyable as possible. We'll definitely be returning. Great hotel in super position, staff always helpful, pool excellent, bedroom facilities good, we enjoyed a relaxing time there. Dated and a bit tired. Parking insufficient and disorganised at times. Breakfast pre-cooked and kept on hotplate. Toast cold and as was the replacement toast. An excellent hotel in a beautiful location. The staff had a 'can do' attitude and the hotel and room were spotlessly clean and comfortable. The food was very good. 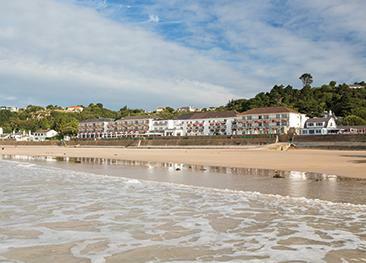 The Golden Sands hotel opens straight onto one of Jersey’s most beautiful and popular beaches.